Any clue about origin of this bowl ? I've lived in Shanghai for three years. I asked the guy if I could buy it, he laughed and gave it to me. I don't intend to make money with this but I'd like to know a bit more about this bowl. He was unable to tell me, except that it was a family stuff. If anyone could tell me a bit more about the origin of this bowl, that would be great. Comments for Any clue about origin of this bowl ? > Would that also be a sign of belonging ? Mostly there is only one, though. The pictures are a bit dark. The blue color should be a bit brighter on the actual item. 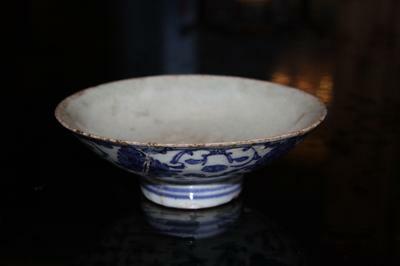 This seems to be a bowl from the first half of the 19th century, Qing dynasty, Jiaqing mark. I would wash it. The underglaze blue will not be damaged by washing it with a dishwasher or soap detergent. The characters in the center are usually made of many little drilled holes. They are dirty from use. 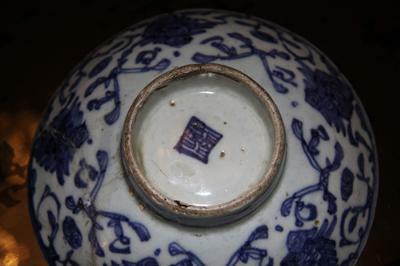 The holes are only in the glaze and aren't that clearly visible, under normal circumstances. 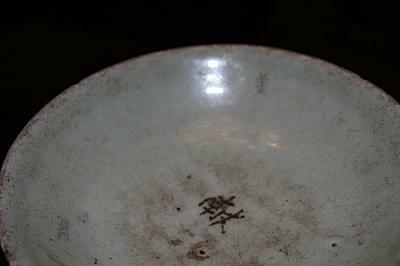 The characters signify ownership of the bowl.